I have 4 VIDEOS for you: Recent Winners, Free Tickets, Semi-Rare Piece, (NEW) Results from 500 tickets (NEW)... also list of winners for Illinois... and a pic of IL biggest prize winner to date! For a while it was very difficult to find any list of winners for 2014 Albertson's Monopoly. I believe my video (below) represented very first list posted online. Since then it got a little better. On 03/18/2014 Albertson's website posted an update with winners that claimed prizes at Albertson's Markets chain (you can see the list below). What wasn't clear at the beginning, this list did not include winners from other chains participating in 2014 Albertson's Monopoly. On 03/08/2014 JewelOsco website published long anticipated list of their winners (please scroll down to see the list). First known to me list of winners found at one of Jewel-Osco stores... bookmark this page for updates! Please allow few seconds for video to load. So far this great Sweepstake Giveaway was only available to residents of Western or Southern regions of US, but not anymore. Due to recent acquisitions Albertson's Monopoly is now offered all over the country. Arizona, Arkansas, California, Colorado, Delaware, Idaho, Illinois, Indiana, Iowa, Louisiana, Maine, Maryland, Massachusetts, Montana, Nevada, New Hampshire, New Jersey, New Mexico, North Dakota, Oregon, Pennsylvania, Rhode Island, Texas, Utah, Vermont, Washington and Wyoming. "You will receive one (1) Game Ticket and one (1) Bonus Game Ticket for a total of two (2) Game Tickets." I did get my free tickets, watch below... or scroll down to see VIDEO with my semi-rare piece! As I understand there will be also a final drawing at the end of the Monopoly. All codes (available on some Monopoly tickets) entered online will participate in a Sweepstake with 75 prizes with value of $1,000 each plus a Grand Prize of $15,000 for a total value of $90,000. 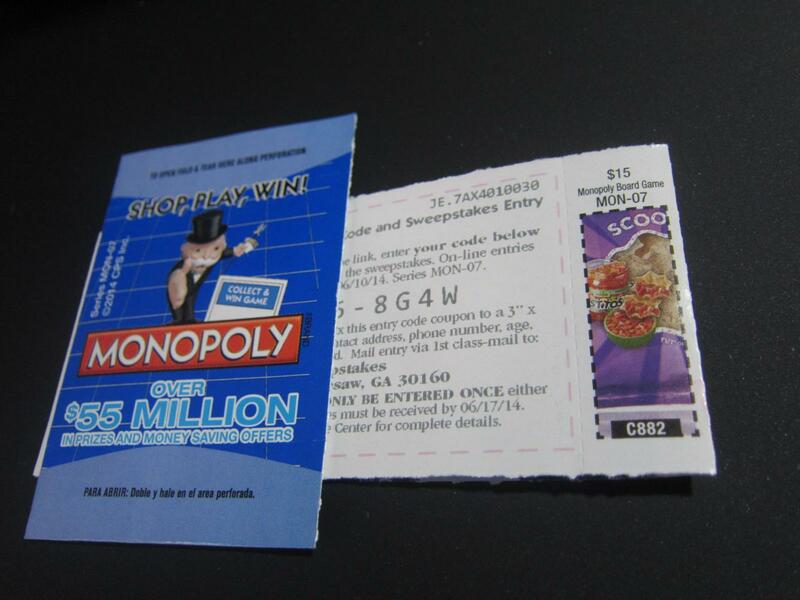 The odds of winning one of these prizes will depend on the total number of codes enter online. "To win one of the Major prizes, subject to verification, simply match the official game markers to the exact corresponding game markers on the official prize specified on the official game board." UPDATES! UPDATES! UPDATES! UPDATES! UPDATES! UPDATES! UPDATES! 03/18/2014. I don't see any winners from Illinois or Indiana, which is a bit strange (and alarming) to me. Would anyone know why? Is it because there were no winners in Illinois and Indiana, or is it because this list was posted by Albertson's stores website (and there are no such stores in Illinois and Indiana)? 04/08/2014. Albertsons Customer Services answered someones question on their website: prizes listed at their website on 03/18/2014 were only prizes claimed by Albertson's Market shoppers (scroll down for JewelOsco list). 04/21/2014. Below video with my results from 500 tickets: NEW! NEW! NEW! NEW! NEW! NEW! It is really nice to see Albertson's (and JewelOsco) keeping us informed and up to date.